Ever since, I have been recommending this show to my family, clients, and my groups. What I especially love about Marie Kondo is her method of only keeping things that spark joy for you. She asks her clients to hold a piece of clothing, a book, or an item in their home and if it brings up joy, it means it is worth keeping. If it doesn’t spark joy, she asks that they thank the item for having served its purpose in their life and let it go. Sounds simple, right? I don't know about you but knowing what joy feels like was foreign to me for a long time. I had no idea of what I wanted or needed, or what felt good to me. Because of my trauma, I was very disconnected from my body and it has been a slow and gradual process of reconnection through different healing practices that have brought me to the point of knowing who I am and what I need, want, and deserve. In the show, people often respond with a blank look when Marie talks about joy and ask “What does that mean, what is that feeling?” She recommends starting with picking up something that very obviously sparks joy, like your favorite shirt or dress or your favorite book that you have read over and over. You quickly know that you love how you feel wearing that or how the story moves you when you read that book. You treasure it and feel connected to it. That is joy! And that is what you should aspire to surround yourself with in your home, not clutter that causes stress, sadness, and anxiety. I so appreciated the diversity of households and people that she helps. From couples needing space for future children, families who want to clean up their space and teach their kids these values, and even people who live alone and need to clear the physical clutter that is also taking up mental and emotional space after traumatic events. 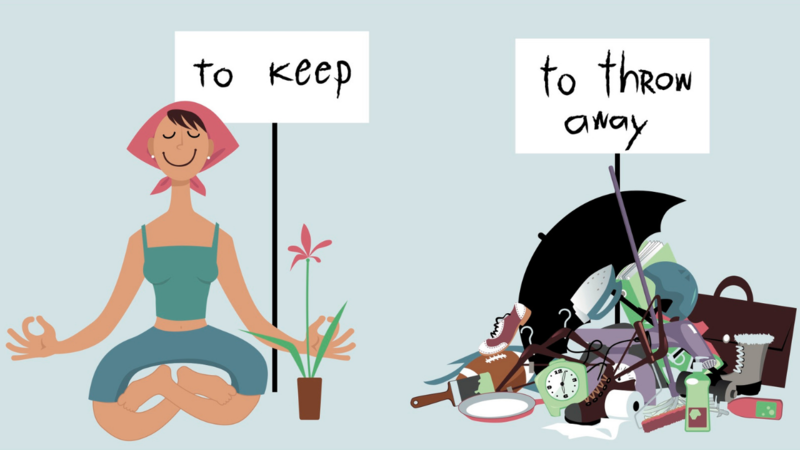 You will see how the act of working together on the seemingly simple task of tidying a home deeply impacts the relationship we have with ourselves and others. An important part of healing after trauma is paying attention to the things that make you feel good and bring you joy, retraining your brain and your body to understand that you deserve to feel good, that you are worthy of being happy. Survivors know all too well what sadness, shame, grief, and guilt feels like. But in healing, they can shift the narrative to reflect how they really want to feel, including happiness, joy, love, peace, and calm. The other important lesson to take away from the show is the importance of letting go of things that no longer serve us. There are many different ways that survivors carry their trauma and past into adulthood, bringing with them bad habits and hurtful beliefs, defensive mechanisms and triggers that kept them safe as children and helped them survive the abuse by disconnecting from reality, building defenses, retreating within themselves, taking on secrets and the burden of shame, repeating awful habits of self-loathing. The list goes on! You might think that I am oversimplifying the process but exactly what Marie asks her clients to do with an item of clothing is what you must learn to do with these old habits, beliefs, triggers, and secrets. Acknowledge them, hold them up, and thank them for the purpose they served long ago, saving your young self and keeping you alive and safe. They are why you are still here today. But you are all grown up now and you can take care of yourself. You can take the reins back and be in control of keeping you and your inner child safe. Have compassion for yourself and for those parts for being present for so many years, be genuine in thanking them for helping you, and let them go. It’s time. They no longer serve you. You will outgrow them in your healing. I highly recommend this show as an inspiration for creating space in your life, in both your physical and emotional space. The show has a deeper meaning if you look close. These practices are a part of self-care, taking the time to give your home (and by extension, you) the care and attention it deserves. This is the space you retreat to, where you want to feel safe and calm, a space you can truly be yourself. Take the time to make sure the energy in your heart and in your home only reflects the healing, loving, safe, warm, and free self that you are rediscovering and making space for. Ready to change? Are you stuck? Don’t worry. I can help! Just follow (this link) or call 619-889-6366 to reserve a one-hour coaching session with me ($125). Let me help you with the next step to healing your life. You deserve it! Reserve your spot NOW! Check out my NEW YouTube channel, I go live M-F at 4 pm pst/7pm est. (most weeks) to connect with the readers of my books, answer questions about healing after trauma, and discuss an important part of healing! Remember to subscribe to receive updates of new videos or Livestream events.